ST. GEORGE — Being a rodeo clown means accepting the “horn rash” that comes from being bounced around by the bulls. Randee Munns, the rodeo clown for the 84th annual St. George Lions Dixie Roundup Rodeo, said although he’s never been seriously injured, he has been trampled several times by bulls. There were two times when a bull’s horns impaled the barrel he was in and lifted him into the air. When that happened, he said he just kept his head down and held on to the barrel before others were able to pry the barrel off the bull’s horns. 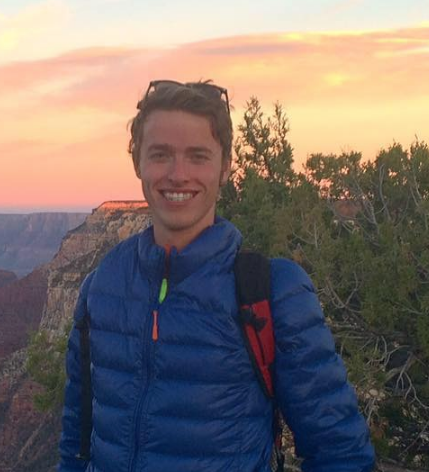 “That was a little more excitement than you need,” Munns said. 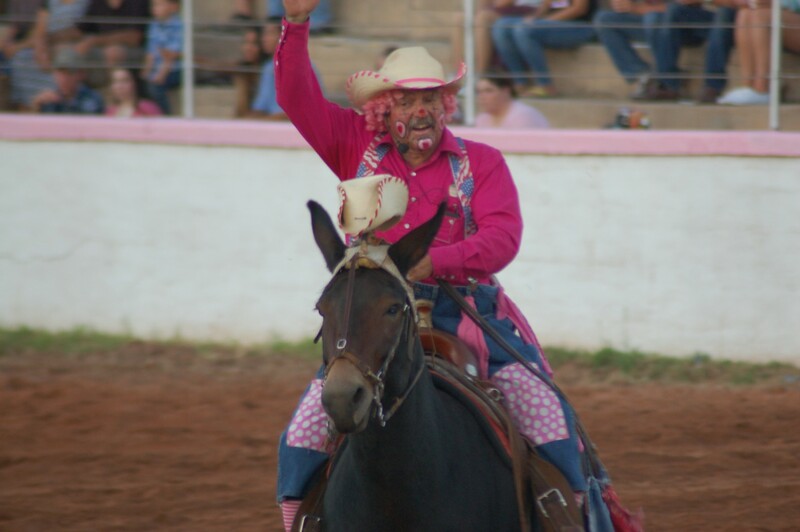 Munns has been working in rodeos for the past 49 years and has been the clown for the Dixie Roundup for over 20 years. He said the best part of being a rodeo clown is the paycheck, but he likes meeting people in the community and interacting with the children as well. A rodeo clown, or barrel man, is the comedic relief of a rodeo who usually stands in a large barrel that he can easily duck into if the bull charges toward him in the arena. The clown also has two henchmen called bullfighters who protect the bull riders and contain the bulls when the rider gets knocked off. “A good barrel man uses his humor and his wits to keep the crowd interested between pauses at the rodeo,” Dixie Roundup contractor Cody Flitton said. Good clowns and bullfighters are key to running a successful rodeo because if they aren’t comfortable around the animals, the bulls can get irritated, which may cause some unforeseen problems at the rodeo “that cause us grief,” Flitton said. Munns is a unique rodeo clown because he has experience with bull riding, rodeo contracting and being a bullfighter, Flitton said. “He’s pretty much done everything there is to do at a rodeo,” Flitton said. Before the Dixie Roundup Rodeo, Munns holds assemblies at local elementary schools to speak about the rodeo and the importance of getting an education. When he’s not sitting in barrels with his face painted during rodeos, Munns works as a welding teacher at Bridgerland Technical College in Logan, so education is something he said is important to him. “Our rodeo is a little more community-oriented, so that time spent with the kids at the elementary schools isn’t typical, and these guys do it more,” Dixie Roundup chairman Greg Mathis said. The people in St. George who enjoy Munns’ presence at the rodeo each year is what keeps him coming back each year, he said. Each year, Munns prepares a different clowning act for the rodeo. This year, besides his usual acts like throwing T-shirts into the crowd and telling jokes, his skit is called “Cowboy Taxi,” which will feature a service like Uber on ponies. “You’re going to have to come to the rodeo to find out what that’s all about,” he said. What: 84th annual St. George Lions Dixie Roundup Rodeo. When: Sept. 13-15. Gates open at 6 p.m. 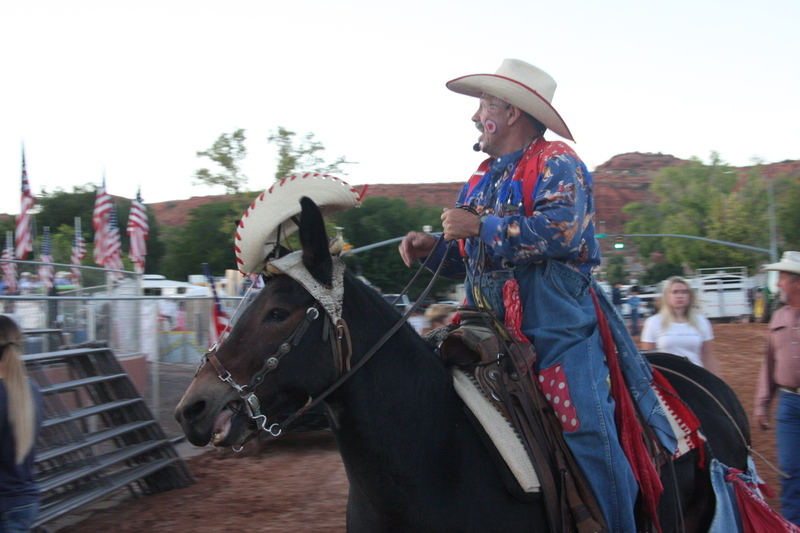 The rodeo is 7:30-11 p.m.
Where: Dixie Sunbowl, 150 S 400 East, St. George. Tickets: General admission for adults is $12 or $5 for children under 11. Tickets are available each weekday from Sept. 10-15 at the Lions Building north of the Sunbowl. You can also buy tickets by calling 435-673-3301. More details on the Dixie Roundup can be found online.